The English or European Oak (and also known as the German Oak in Germany) is found growing throughout Northern Europe and in particular, in the UK. In the UK, it must be one of the most common deciduous tree species alongside Beech, Hawthorn and Birch. 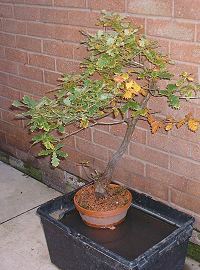 However, as with Birch, the English Oak can prove to be a surprisingly difficult tree to cultivate for bonsai. The most common difficulty I have experienced with English Oak centres around its negative reaction to root disturbance. While finding most other UK natives easy to collect from the wild, I would find that Oak had a high tendency to fail, those that did survive through to the following Spring would often suffer dieback of some, or all of, the branches. It wasn't unusual for the trunk of a collected Oak to die back to be replaced by many suckers from the base. Having had too high a percentage of large Oaks fail (2" or more diameter trunks) completely or suffer sufficient dieback to make the tree virtually worthless for bonsai, I stopped collecting them through a mixture of frustration and also a degree of guilt that I was causing the unnecessary death of these trees. I frequently go out walking through the countryside near my home and its a good opportunity to observe the seasons and how different tree species react to their environment; the effect that the sun, rain and temperatures have on different species through the year. One of the areas that I walk is used on occasions by off-road vehicles and I also see the effect of acute damage to trees, normally after some idiot on a quad or 4x4 has ploughed through a stand of smaller trees. I began to notice that though my carefully collected Oak would suffer dieback or complete failure, Oaks that were being run over, partially uprooted and badly damaged by vehicles (sometimes on a number of occasions over the course of year) would always recover without dieback of branches or the trunk. Over time I noticed that the Oaks being damaged during dormancy would dieback or die. But Oaks that were recovering were those that had been damaged during the growing season while they were still in leaf. It didn't seem to matter how dry the ground was or how badly damaged the root system appeared to be, the Oak that was in leaf would inevitably recover. Oak are one of the last UK native tree species to leaf out, very often as late as early June in the North of the UK; they are incidentally, often one of the last species to lose their leaves in Autumn, sometimes as late as November and beyond. In accordance with the general collecting and repotting advice I have always collected Oak before the new buds start to open in Spring. In fact, I have previously tried anytime between February right up to May. Given the difficulties I had experienced when collecting Oak, until this year, it had never occurred to me to collect Oak once they had leafed out. In early June this year, I completely trenched and undercut a number of Oaks (trunk diameters 2"-5") to the extent that the rootball could be lifted clean out of the ground. All of these trees had their new leaves just open or in the process of unfurling. To really test my theory that Oaks respond positively to root pruning while in leaf, I cut the roots back hard leaving a rootball just 12" in diameter for trees that had a trunk 2" in diameter, and an 18" rootball for trees with a 4" or more trunk diameter. June 2005 then proceeded to be very dry, without rain. However, every single one of these trenched-trees not only leafed out fully but they also extended new shoots, indicating that new root growth was also occurring. There was no sign of dieback, disease, weakness or even mildew (something that always seems to appear on weak Oaks with ease). The only visible effect on all of these Oaks was that the leaves were uniformly much smaller than normal. In an effort to test my theory further, in August I decided to start collecting some Oak. August is a very wet, humid month in the North of the UK. Night temperatures are consistently warm (never dropping below 10C) and the days tend to be cooler and importantly, more humid, particularly near the end of the month. Along with early June, I believe mid-August to the end of September maybe optimum times to collect English Oak in the UK. During this period, the tree still has plenty of time to recover from collection before the onset of cooler days and nights in October, and of course, dormancy. During August and September this year I collected 3 Oaks and lifted 1 Oak I had growing in my garden. Trunk diameters ranged from 2" to 3". To push my theory as far as possible, all were completely bare-rooted, root pruned by as much as half of the collected rootball and planted into small containers. Importantly, after potting each of the Oaks up, all 3 collected trees were then submerged in water for between 2 and 3 weeks. 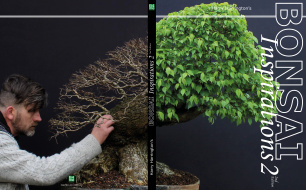 Submerging a recently repotted tree or cutting in water is a very useful technique for trees that are still in leaf. The abundance of water enables new roots to easily take in water and stops the leaves from becoming limp and falling.Here an Oak collected in September is shown. For the first few days after collection, the pot was fully submerged in the water, over the past 2 weeks the pot has been slowly lifted out of the water as new roots form in response to their pruning.